A 39-year-old male presented to the clinic with a 5-month history of a slow growing, solitary lump on the medial arch of his left foot. He had no inciting event or history of trauma. Initially, the nodule was not painful, but now the patient has pain while wearing certain shoes and with prolonged walking or standing. When off the nodule, he has no pain. 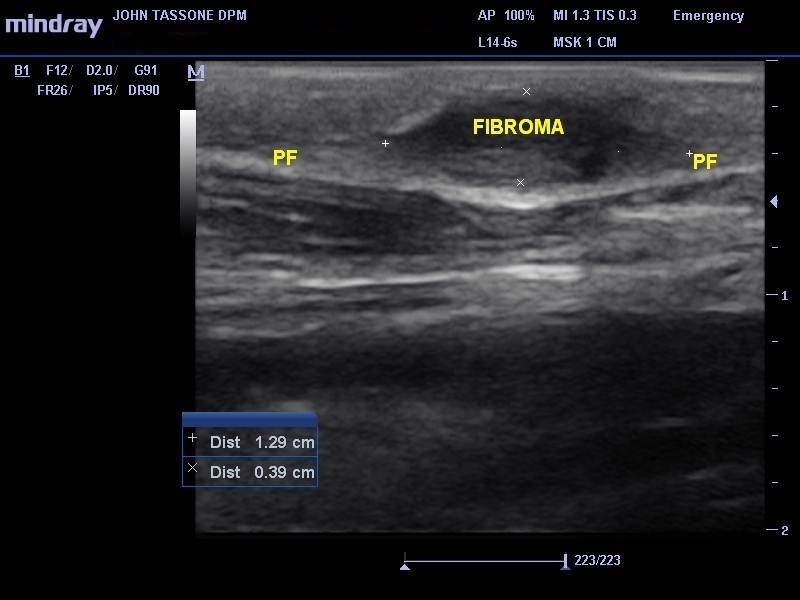 Clinical assessment revealed a spongy mass on his plantar left arch consistent with a fibroma. X-rays were unremarkable. An ultrasound was performed utilizing a linear array 12 megahertz probe at 1 cm depth and focus at the level of the lesion. Longitudinal and transverse images were obtained. 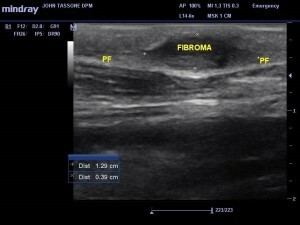 Sonographic appearance of a typical fibroma includes a discrete, hypoechoic or hyperechoic fusiform nodular thickening of the plantar fascia (Figure 1). 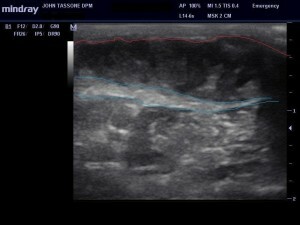 The patient’s ultrasound, however, revealed compartments within the nodule (Figure 2). The nodule’s appearance raised concern for a fibrosarcoma, which will present sonographically with compartments and calcification with posterior acoustic shadowing.1 All of these signs were present on our ultrasound examination. We ordered an MRI to further assess this lesion and requested the opinion of a musculokeletal radiologist. MRI revealed that this was indeed an atypical plantar fibroma, but it was not consistent with a fibrosarcoma. The patient was informed and opted for monthly assessments and possible biopsy if the lesion changed in any way. Figure 2. The plantar fascia is blue. The mass is between the red line and the fascia. Note the echogenic lines within the hypoechoic mass, consistent with a compartment-like appearance. 1. Hoffman D, Bianchi S. Sonographic evaluation of plantar hindfoot and midfoot pain. Ultrasound Med. 2013;32:1271-1284.